Do you like to run? Join Team CJ! 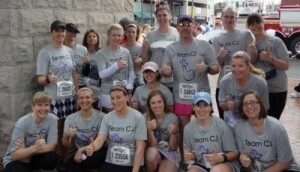 Whether you are running the Monument Ave 10K, the Disney Marathon, or an IronMan, any individual raising funds for CJ’s Thumbs Up Foundation (CJSTUF) via an organized race or walk can be a part of TEAM CJ. How do you sign up for TEAM CJ? Contact our staff or click on the button below to get started. We can help you with questions or any other logistics for which you might require assistance.